I have an awesome program that Xander and I have been reviewing the past few weeks. Star Toaster gave us their Orphs of the Woodlands online software. This program is an online reading adventure. Children are encouraged to read through the story - in our case it is the first one in the series - Treasure of HighTowers. After completing the reading then the fun unlocks. Kids can work jobs the jobs earn you rewards which you use to take care of your Orphs. For the reading portion of Woodland Orphs, you read the chapter online. Each chapter varies in length. As you work through the chapters the story unfolds. You will earn your first couple of Orphs after completing your first reading chapter. It is your job to take care of them. Orphs are little critters from the story, they are poor, homeless and uneducated. They need your help! These are task you complete. There are many different kinds. They usually have an academic theme like math, quotes, science - kids learn without even realizing they are doing learning. As you complete jobs you earn gold stars, which are the currency in the game. These are the currency in the game. You use these buy clothing, water, houses, land and other items for your Orphs. My son Xander was the primary user of this product. He is 12 years old and in 7th grade. He really enjoyed his time working. He used our main computer to work on the program several times a week. Once he got on the program he would spend a lot of time there. I had to remind him when it was time to be finished or I think he would have stayed on all day and night. One of the things I really liked was how hands off this was for me as a mom. I just signed him up and he was able to navigate the rest. That might not be the case for younger students but for him it was exactly that way and worked well as I've been not feeling well lately. 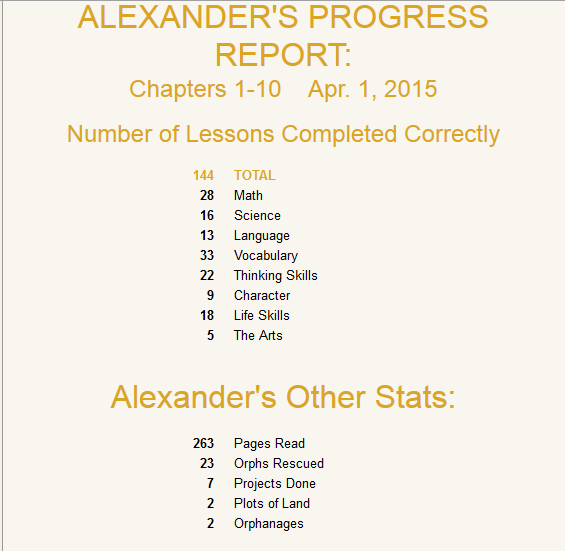 I received progress reports from Star Toaster telling me what Xan accomplished and what was coming up next. I really like that sort of thing because it helps me to keep track of how much he is accomplishing and see that he is actually doing work. Another thing I liked was that it was a learning activity. Xan had fun doing it but he was also learning. I feel like this would be a great summer bridge activity! I plan on having my older son use it come June. I also like that it filled a need/gap. Both of my kids like to play online games however I'm cautious about what I allow them to do online. This was a secure site that doesn't include any interaction with other people on the program. I really appreciate that because internet safety is a huge concern for me! I think the only thing I know some parents might be concerned about it the story line. It is a fantasy type story. We have no problem with that kind of thing but I have friends that do. Overall as a parent I was thrilled with the product. I will have Xan complete the story in the upcoming weeks. Star Toaster's Orphs of the Woodlands is a fun and educational game to explore. In this story you work your way as a spy to fight against the dreaded Night Creatures to find a treasure while taking care of Orphs and earning Goldstars. There are fun jobs to do, recipes to make, and a big vocabulary to learn new words from. After fulfilling the tasks you need to do to earn the Goldstars you can buy food, water, clothing, heat, housing, and land. I enjoyed the educational minigames to play and the storyline is phenomenal. I really enjoyed and I would do something like this everyday! This program subscription is $19.99 for two months and extensions are available for $6.99. If you would like to try it out they offer free trial.